Out of 50 US states, South Carolina made it to number seven in the top ten list of places people are moving into. If you already live in South Carolina, you’ll know why this wonderful state made the list. From the low cost of living and low property taxes to the gorgeous coastlines, it’s a great place to spend time. Furthermore, the Palmetto State boasts amazing cities such as Columbia and the gorgeous Charleston with its fascinating history and extremely cool music scene. South Carolina also has huge employment and education opportunities. In fact, there are 61 colleges and universities to choose from, including Wofford College. The state is also home to many famous people including actor Bill Murray and singer-songwriter Darius Rucker. But, what’s best thing about this state? Arguably, it’s the wonderful beaches. In fact, South Carolina beaches are some of the most accessible and breathtaking in the entire nation. If you’re planning a trip to the area or even a move to the state, it’s first worth finding out which beach is right for you and your family. In this article, we’ll look at the best South Carolina beaches and the reasons why you should move there. 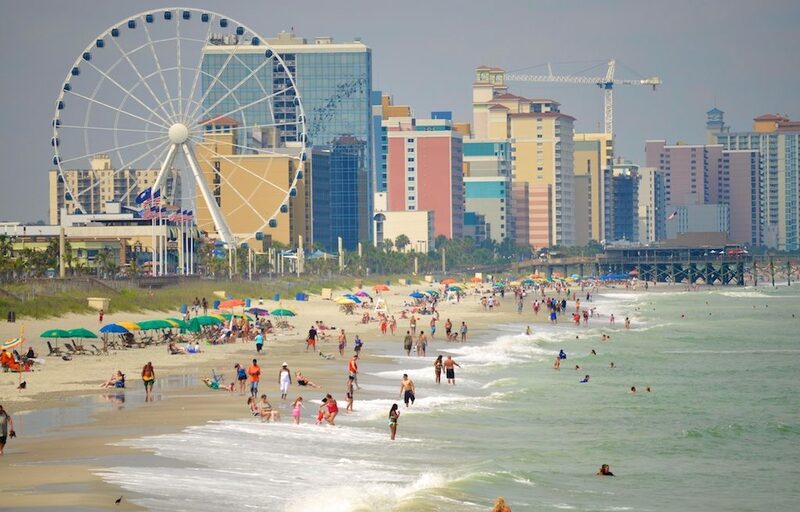 Topping the list is the beautiful Myrtle Beach. This location offers you both a sea view and a taste of city life. What’s not to love? This location is probably the most well-known of South Carolina’s beaches. As a result, it is a popular vacation resort, but many people also love living here all year round too. Myrtle Beach is claimed to be the “hub” of a 60-mile long string of other beaches called the Grand Strand. Due to its closeness to the water, it is a very popular spot for water sports. If you want to try jet skiing, parasailing, kayaking or scuba diving – this is the place for it. If you’re hoping to retire to South Carolina, this is certainly the place to be. You’ll find golf courses designed by celebs, over fifty mini golf courses, beaches for strolling with your loved ones, and hundreds of bars to choose from. Planning on eating dinner out? You won’t have tasted seafood as good as that in restaurants at Myrtle Beach thanks to them being so close to the ocean. Furthermore, for those moving with family, there are hundreds of attractions, such as the SkyWheel. This is one of the tallest Ferris Wheels in the entire country. But, if you’re considering moving to this area, make sure you find a real estate agent who is trustworthy before you buy a million dollar home. As the name gives away, the second best beach on this list is just north of the first. North Myrtle Beach is a city and also part of the Grand Strand. Start your days by watching the sunrise over the Atlantic while taking a stroll on one of the area’s most beautiful beaches. You’ll then be able to enjoy a day packed full of golf or sport. Alternatively, you could plan a trip to a vineyard where you can enjoy local wines and music while chatting to friendly Southerners. If you love to dance, this is one of the best places in the country for you. In fact, it’s home to the dance move “the Shag” and you’ll find locals dancing the night away in the Ocean Drive. For little ones, there is always Alligator Adventure. This park is the “reptile capital of the world” and boasts over 200 species of animals. The 15 acres will certainly take a while to explore. North Myrtle Beach Condos also has Cherry Grove Beach and its infamous pier. After a stroll, don’t miss Basil’s Pizza for a bite to eat and About Thyme Oceanfront Café & Cocktails for drinks. Around 10,000 people live in Garden City Beach with many families calling this stunning location home. In fact, you’ll likely find that most of them came for a vacation and simply couldn’t get enough. As a result, there are condos and beach houses galore for visitors with stunning views of the Atlantic. Garden City Beach offers a simpler way of life with fewer distractions (such as hundreds of restaurants or shopping arcades). But, if life gets a little too quiet here, it’s just ten miles south of Myrtle Beach. Many locals take to the waves every day proving that Garden City Beach is a great place for surfing. Whether you’re a seasoned surfer or want to learn, you won’t be alone. In fact, Village Surf Shoppe is a local shop which has been in Garden City Beach since 1968 and making Perfection Surfboards since the 80s. After a long day of learning to surf, try out Pacino’s Mediterranean Grille or Squids On Atlantic for a bite to eat. Intending on moving with your family? Surfside Beach may be the perfect place for you. In fact, it has the nickname amongst locals of “The Family Beach”. Children will enjoy attractions such as Wild Water and Wheels. This is a water park that offers fun slides and pools along with a go-kart track. Little ones who love mermaids will also be able to turn into one for just a few hours with a “mermaid makeover“. Lessons for how to be a mermaid take place at Wild Water and Wheels. For adults, there are state parks to enjoy, art museums to peruse, and many bars to spend the night chatting and drinking in. Most notable is Scotty’s Beach Bar where you can sip your drink with an ocean view. Bliss! This fishing village is quaint and historic. If you’re looking for somewhere where you can be close to nature, go on long walks and reflect on life in peace – this is the place. You’ll find many creative types at Murrells Inlet and it’s a great place to express your own creativity too. Being so close to nature and water has a way of encouraging everyone to express themselves through art. However, it’s likely that there will be more people coming to the area in the next few years. This is due to a local drive to encourage more businesses to move here. You can learn more about the community revitalization group’s plans over on its dedicated website. As well as trying to attract more people to the area, the group has also benefited the larger community by organizing cleanups of the area and sourcing money for the Bike Bridge Marshwalk and Jetty View Walk. This tight-knit community is certainly one to join if you’re deliberately moving away from a place where neighbors don’t try to get to know each other! Brookgreen Gardens – this public space is the perfect day out with loved ones. You’ll find a wildlife preserve and sculpture park here. Huntington State Beach Park – want to go camping? This is the best place for it. This beach is very secluded and offers you the chance to swim and relax with friends. There’s even a mansion to explore too. The Murrells Inlet Marsh Walk – take a quiet stroll and bring a book. You’ll find hundreds of eateries to stop at and places to sip coffee while you learn something about the area. Why not go for a short-term rental and visit Murrells Inlet yourself throughout the year? You’ll certainly make some money on the investment when more businesses move in. This city sits upon a barrier island also called the Isle of Palms. It’s a very popular spot for holiday-goers and retirees for good reason. You’ll find stunning condos facing the beaches and hundreds of restaurants, bars, and resorts. Facing the ocean is Isle of Palms County Park, which is a great place for a day out with family. You’ll be able to picnic here with loved ones, enjoy the playground, catch some rays and enjoy the sea view. There is history everywhere you look. In fact, close by you’ll find Fort Moultrie. This was a very important location during the Civil War. Teach your family about important days gone by and enjoy a new life in the area. If you’re into golf, Wild Dunes Golf Course is the best place for you to head. It’s popular with locals not only thanks to its golf course but also because of its tennis courts! Stay fit throughout your retirement by living in Isle of Palms. If you’ve made a life for yourself in Charleston and don’t want to move too far away, have you considered Folly Beach? Here, you’ll be just a twenty two minute drive from friends, family, and the bustling city way of life. But, you’ll also be able to wake up to a beautiful beach view. One of the most impressive aspects of this beach is its pier, which stretches out more than 1,000 feet into the ocean. On a foggy day, you’ll feel like you’re walking on water. This beach has many activities on offer to everyone. Learn to surf, kayak, canoe or sail! Better yet, Folly Beach is also a great place for enthusiastic fishers. There’s a great local shop which can help out those who are new to fishing too. How do you feel about swimming in the ocean? This is possible at Folly Beach County Park. This preserve is arguably one of the most stunning in the country. Finally, after a hard day of fishing or swimming, try out a few of the best local bars. These include Lowlife Bar, Chico Feo, or Surf Bar. The absolute highlight of Hilton Head has to be its Harbour Town Lighthouse. If you move here, your gorgeous social media posts will be making friends and family very envious! You’ll be able to enjoy catching rays on the Atlantic ocean beaches and play golf all day, every day. Hilton Head is located close to the border of Georgia. So, those who enjoy being close (but not too close) to a big city, will be able to take frequent trips to Savannah. For long days out at the beach, try Coligny Beach Park. You’ll be able to swim, bike, and run to your heart’s content. This is a gem of the area and makes it a wonderful place to visit. Don’t miss the Coastal Discovery Museum. You’ll have heaps of fun while also learning a whole lot on its nature trail. You can expect stunning gardens, huge live oak trees, and wildlife including a butterfly enclosure. If everywhere on this list feels a little too commercialized for you and your needs, then Edisto Beach is the final place to check out. In fact, it is known for being uncommercial. It’s always been a popular spot for weddings and, as a result, honeymooners too. You’ll find lots of loved ones shacking up, looking for their dream home. There are hundreds of vacation rentals here and you’ll come across many families getting away from the stresses of strains of city life. Think happy campers, cyclists, swimmers, and fishers. At the end of a long day full of your favorite activities, don your best outfit and head to an upscale restaurant for a bite to eat. Edisto Beach is a beautiful spot. But, for those who love having a little more going on every evening, Myrtle Beach may be a better choice. South Carolina beaches are arguably some of the most beautiful in the nation, if not the entire world. Whether you choose Myrtle Beach or Hilton Head Island for your next trip, you won’t regret it. In fact, you may find that you love South Carolina beaches so much that you want to buy property here. Thanks to the low property taxes in this state, this may not be a bad idea! 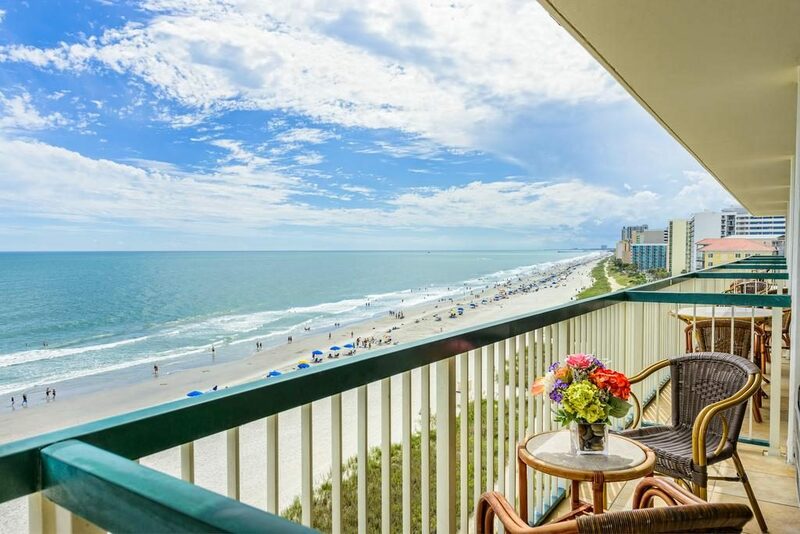 If you are from outside of South Carolina and are hoping to buy a condo in Myrtle Beach, North Myrtle Beach Condos, Garden City, Surfside Beach or Murrells Inlet, we can help. In fact, we have hundreds of condos for sale. Check out some of them here. You could be moving to your dream home in no time.